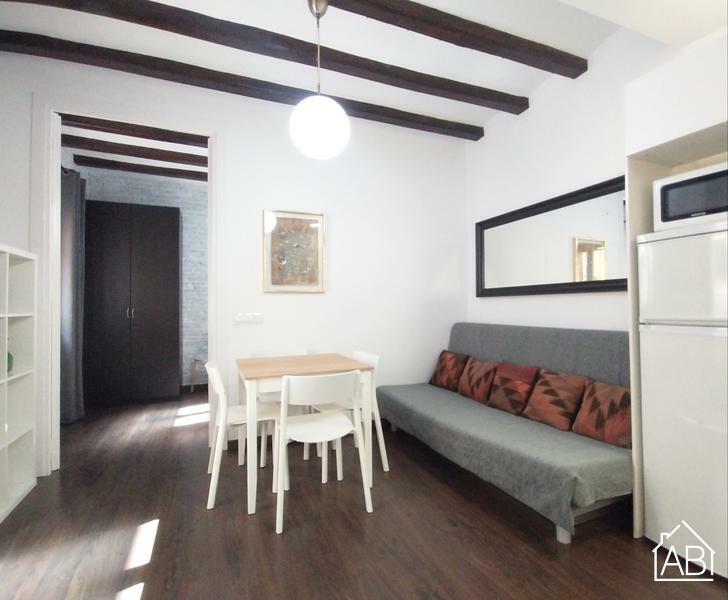 This simple, cozy one-bedroom apartment in Barceloneta is the ideal at any time of year. Situated amongst many beaches that are lined with bars, cafés and restaurants, as well as being a ten minute walk from the center of Barcelona, you will have the city at your fingertips. This apartment can accommodate up to four people. The apartment has a true feel of traditional Spanish architecture seen through such elements as the exposed brick walls and ceiling beams. The living room has a comfortable sofa and a TV, perfect for relaxing after a long day. The kitchen, though compact, is fully equipped with all of the utensils and appliances needed to create your very own home-cooked meal. There is an Internet connection in the apartment. The main bedroom has two single beds while a double sofa bed can be found in the living room. The apartment has one bathroom with a walk-in shower. This charming apartment, complete with heaters and air-conditioning, as well as access to a balcony is the ultimate living space in any time of the year.